I got this new release stamp set from Penny Black. Stamped in light brown onto mixed media paper and then no-line watercoloured over top with Stampin' Up! inks and Distress inks. Once I was finished the snowman, I heat embossed in clear before adding a wash of soft brown and blue to the background. Final step at to stamp the sentiment in black. There's lots of amazing entries at the challenge. Come check them out and be inspired to play along. The challenge is open until October 3rd. Don't miss it! Loll, your watercolouring on this is absolutely fabulous - wonderful shading! I love it! Wowza ... that is some fantastic watercoloring ... and such a lovely snowman ... so very glad you shared your SNOW with us at Jingle Belles. Always gorgeous CAS work, Loll! The depth of shading is lovely! WOW adorable, I love your snowman, Loll. Fantastic watercoloring. 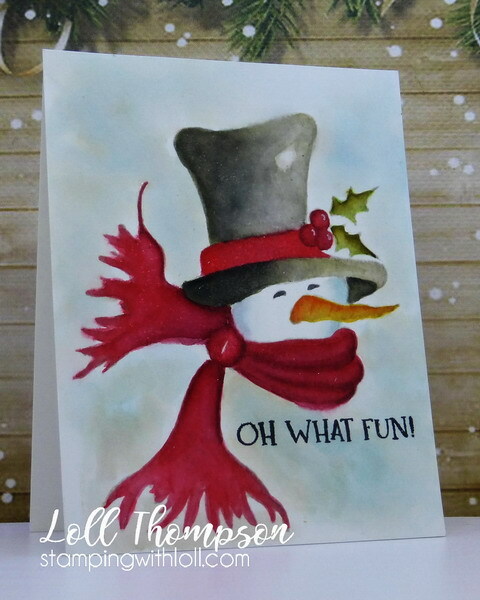 What a dramatic card Loll - love how you have coloured the wonderful scarf around the snowman - it is such a contrast to the hat and snow. This is amazing...I wish you could come teach me how to do this! It never looks as good when I try! ADORABLE! Others have used that word in their comments and I have to, too, to describe this card. The water coloring is amazing. What a handsome snowman, Loll! I love his rich, red scarf and hat band! A beautiful watercolor card! Fantastic watercolour card Loll. He is such a wonderful snowman - and the background makes him jump off the page! 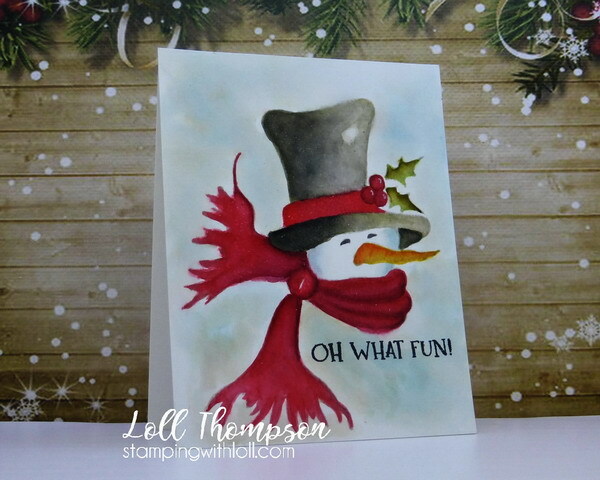 That's one special snowman stamp and love the no line stamping and you've coloured him in brilliantly x Fun and adorable card x. Your water coloring is superb on this one! Wow, it's such a large image and you did it perfectly! I'm not sure I'd even attempt it but love the image and the outcome! This is outstanding, Loll! Oh what fun is right!! this card is so pretty and perfectly colored! You have given him a sweet Vintage feel. Love it! I love this little chap, in fact he made his first appearance in my craft room the other day. I was intrigued by this stamp when I saw Therese do it all in gray. You've really brought him to life with your wonderful watercoloring, Loll. This is so adorable, Loll! Your no-line watercoloring is fantastic and the shading is amazing! I especially love the way you watercolored the hat (the soft velvet-like fabric). The soft wintry wash in the background is beautiful too. OMGoodness Loll this is amazingly beautiful with your no lines water colouring. Just the sweetest snowman.